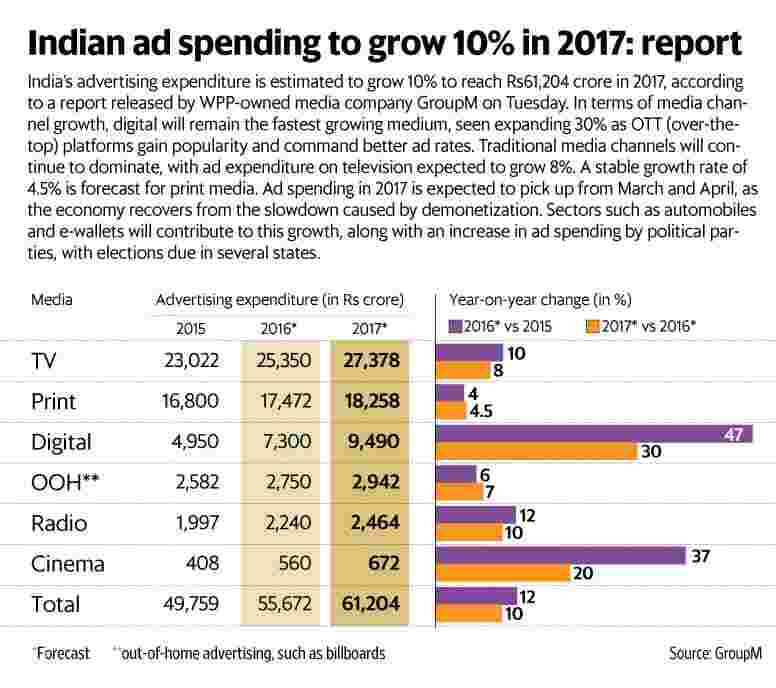 New Delhi: Advertising expenditure in India is expected to grow at 10% to reach Rs61,204 crore in 2017 over 2016, according to a forecast by WPP-owned media agency GroupM in its report This Year Next Year (TYNY). Meanwhile, print will witness a modest yet stable growth of 4.5% with the increase in ad spends expected from print-heavy sectors like auto, banking and financial services and insurance (BFSI) and e-wallets. It would be an interesting year for radio which is expected to grow over 10% with an increasing number of radio stations being launched under Phase 3 of radio privatization. As per the trend in recent years, cinema advertising will also grow at a high double-digit rate of 20%. Cinema consolidation, which has led to investments in infrastructure, coupled with the growing acceptance of premium Indian and Hollywood content by advertisers, augurs well for the medium. “Given the challenges in the business environment, 10% is not a bad growth rate. We are witnessing signs of revival, post-demonetization, and it will start reflecting in the growth of ad spends. The second half of the year is expected to be better for the industry. Sectors like media, auto, BFSI and e-commerce led by the payment wallets will contribute to this growth. Government and the media sector has increased its ad spends making up for sectors like FMCG , consumer durables, real estate and retail which will still take time to come back to the double-digit growth," said C.V.L. Srinivas, chief executive, GroupM South Asia. He added that digital will be the focus not just for the advertisers but also for the media owners, be it publishers or broadcasters. The medium will become more accountable with television rating firm Broadcast Audience Research Council (BARC) expected to roll out its digital video measurement by the end of the year, and with Audit Bureau of Circulations (ABC), an independent body that provides audited newspaper and magazine circulation data, having decided to start measuring digital properties. “I agree with the growth prediction as there is a stronger push both by private and government sector on digital necessities especially in the online payment space. The report focusing on bringing accountability in the medium through viewability metric shows the maturity curve that it is approaching. My only point of concern is that as media spends grow in the digital medium, increasing client anxiety shouldn’t result in a trade off on the agility and innovation that has been the hallmark of digital," said Amaresh Godbole, managing director of DigitasLBi India, the marketing and technology agency of Publicis Groupe. “With telecom players offering affordable 4G data, it has given a great fillip to the OTT space. As more and more consumers adopt the medium, the advertisers will follow. I see a lot of consumer durables, electronic and automobile firms, as well as premium FMCG companies, looking at advertising on OTT platforms," said Uday Sodhi, executive vice-president and head (digital business), Sony Pictures Networks India. “We are pleased with the report. However, it should provide growth numbers for English and Indian language newspapers. In the past few years, English dailies have grown around 1-2% while Indian language print publications have grown at around 8-9%," said Girish Agarwal, promoter director, DB Corp., the publisher of Hindi daily Dainik Bhaskar.